I have an aversion to throwing any food away, as I’ve often written about here on this blog. It just feels wasteful (well, actually, it IS wasteful) and given the number of people in our country (not to mention the world) who go hungry each day, it just feels wrong. So this summer while I was rehabbing from my knee surgery, and my friends were showering me with homemade meals, I found myself wrapping up single portions of things and freezing them so they wouldn’t go to waste. One such meal was the huge container of pulled pork my friend Jean brought over. I had been using the portions for tacos, smothering them with some green chile and baking them, but wanted something different. 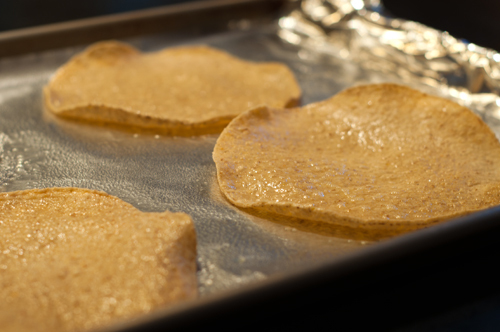 I also wanted to try baking corn tortillas to make them crisp instead of frying them. Turns out that works great – just spray them lightly with cooking spray and bake until crisp. 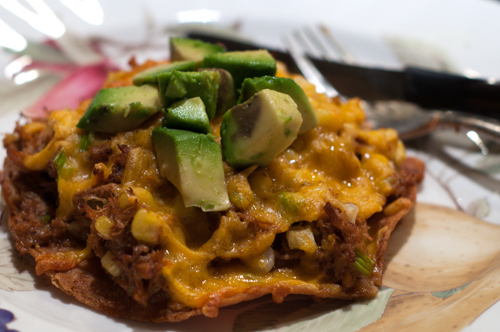 You can put anything you want on top of the tostadas – in an effort to sneak in some veggies and use things up in my fridge and freezer, I mixed the pulled pork with corn kernels and chopped green onions, then topped that with some shredded cheddar cheese. If you heat the meat mixture in the microwave before topping the crisp shells, you only have to bake it long enough to melt the cheese. Add whatever you want as a garnish – diced avocado is my favorite, but salsa, sour cream, or more chopped green onions would also be good. Growing up with parents who lived through the Great Depression, getting the most of left overs has certainly rubbed off on me. I hate to throw away food. 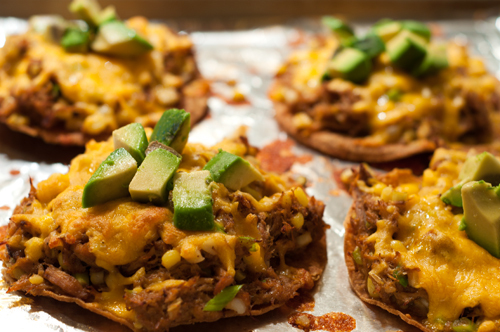 Tostadas are so easy and versatile. Your photos made me instantly hungry.